One hour left I believe, do we make any moves? If we stand pat we know they are tanking the rest of the year right? Trade Jameis for Ty Montgomery. Well they just gave him to the Ravens for a 7th round pick! But they already have 3 QBs on their roster so guess it wouldn't have worked anyway. Damn.. 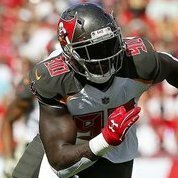 Saw that the Giants want a 2nd for Landon Collins, not sure if it's worth it but would be curious what they want for Jenkins. Looks like MJ will be out for a while as well so we're down to Davis/Grimes and some PS move ups? I can’t remember a trade deadline that was this active. So many team blowing it up/ straight up tanking. The fact we’re not involved suggests this staff is cooked. We need oline help and defensive help, yet I’ve not seen us linked with anyone. Got to think that comes from the Glazers preventing this staff mortgaging a future they’re not part of. Winston for Landon would have been a nice move. JJP, David, Landon would have be a nice start to all three levels. I would have taken Fowler or HaHa for what the teams got them for. No doubt it is "win now" for this regime. I would have taken a 3rd rounder for him because unless this regime survives I doubt a new GM would be interested in paying a 30+ yr old 2 WR that kind of money with Godwin still on his rookie contract. I would of done it for a second. We won't be getting anyone better than Collins in round 2.